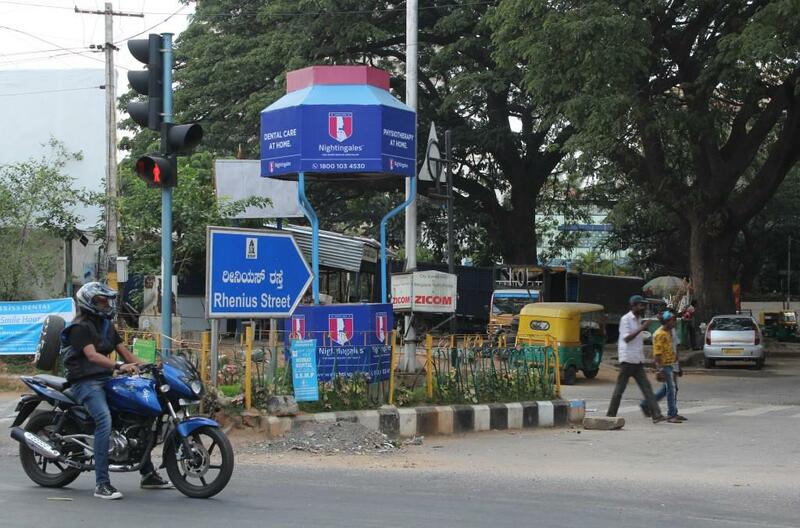 Rhenius Street begins off Richmond Road at the corner of Baldwin Girls High School (1880) and meanders past temples, the Richmond Town Park, some massive but beautiful banyan trees and the Akkithimmanahalli Tank (now a playground and Hockey Stadium amongst other things) before reaching Nanjappa Circle at the other end. Come walk down with me while I tell you its story. Despite its proximity to Bengaluru’s CBD, this upmarket residential area faintly resembled a pastoral English village till not so long ago. The tightly wedged, high rise buildings you see here now were non-existent and Shantinagar had not been imagined on the other side. Vintage photographs show people cycling past the tank, while quaint monkey top bungalows built for the area’s considerable Eurasian and European population overlooked it. The streetscape changed drastically over the years, but many local residents don’t know that the street continues to be named after Charles Rhenius (b.1821), grandson of Otho Gottlieb Nikolaus Rhenius, a West Prussian army officer, and son of a famous 18th century Lutheran priest whose life story began in Europe and ended in a hot, dusty town in Tamil Nadu as the `Apostle of Tirunelvi (Tinnevelly)’. And like many stories hidden in Bengaluru’s nooks and corners, this one too, is quite incredible. Charles’ famous father, Charles Theophilus Ewald Rhenius was born at Fort Graudens on the 5th of November 1790, a year after Mysore flung itself into the Third Anglo-Mysore War, a bitter battle fought against the East India Company. An interest in theology sparked at the age of seventeen, while managing `Bachmann’ his uncle’s estate, near an area called Memel. Following an ecclesiastical education in Berlin, he was ordained as a priest in the Established Church of Prussia. Much to his family’s consternation, he was selected by the Church Mission Society (CMS) to serve in far away, unknown India. He stepped aboard the Marquis of Huntly at Portsmouth, England on 14th February, 1814. India would eventually prove to be a test of endurance for the twenty five year old priest. But his journey here was no less taxing. It included encountering rough weather around the Bay of Biscay, a threat of shipwreck near the Maldives and a fire on board the ship. Rev. CTE Rhenius finally arrived in Madras on the 4th of July 1814 from where he and his companion, Mr.Schnarre, were despatched two weeks later to the Tharangambadi (Tranquebar) Mission in a palanquin with an advance of three months expenditure money. He spent his time here mastering Tamil and in 1823, set about revising the Johann Phillip Fabricius version of the Tamil New Testament before being assigned to do God’s work in Black Town, Madras. A strained relationship with the Madras Corresponding Committee of the CMS found him being sent to Palayamkottai to assist an ailing Reverend James Hough. The CMS mission in that remote part of South India followed the Lutheran Tranquebar tradition. He established schools and churches across the district and augmented studies in Tamil Grammar. All went well till a conflict of opinion broke out over some young evangelists who had been ordained by him in the Lutheran manner. The CMS Committee believed it should have conformed to Church of England rites. Continuing dissent over the matter with the Anglican Diocese of Calcutta saw Rev. CTE Rhenius’ dismissal in 1835 and a move to Arcot with fellow missionaries. But his loyal congregation invited him back to Tirunelveli where he continued as the German Evangelical Mission till the stress as well the strain of serving in India for twenty four years took a toll on his health. He was laid to rest in Adaikalapuram, Tirunelveli in 1838 at the age of 48, leaving behind a widow and nine children. He had never left the country, even for a day. His second son, Charles Rhenius, was to become a fully accredited missionary of the Society eight years later. City chronicler Maya Jayapal says in her book `Bangalore. Roots and beyond’ that he served in Bengaluru between 1867-1869. The street, I discovered, is named after him. Road names often go beyond immortalising an individual in public memory. They imbue a locality with colour and help build a connection to it. I see Rhenius Street differently now and hopefully, so will you. This story was previously published in the Bangalore Mirror, October 19th 2015. Where to find it: Off Richmond Road. What to do around here: Hang out in the Richmond Town Park, visit Mahaveer Chand’s Vintage Shop for old world memorabilia, head to Something Fishy for lunch near Divyashree Chambers, walk down to the gallery 1, Shanti Road (Shantinagar) and catch an exhibit or visit Gallery Skye in Langford Town.Walk through Johnson Market to Hotel Fanoos for a meaty roll, and top it up with Seekh Kebabs and Sewai at Siddique Kabab Centre before calling it a day. Thanks for the history f this road which I use so often. Very much there 🙂 in the same place.